This newspaper photograph depicts a wonderful band caught in action at the Chicago Historical Society. The leader is the elusive, wise, generous, acerbic, witty, sad clarinetist Frank Chace — you can see his bass sax to the rear. 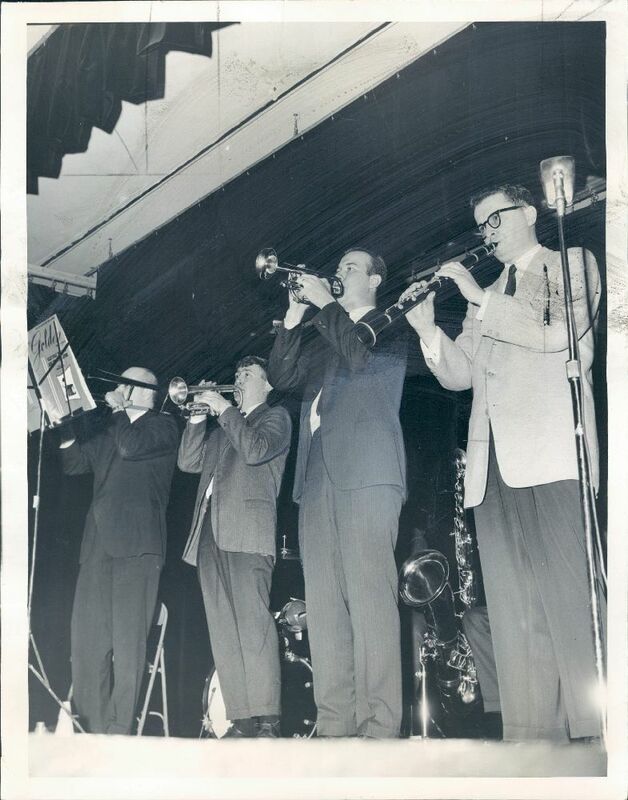 Next to him is cornetist Lew Green, then cornetist Jim Dapogny, surely also playing piano on the date, and the late trombonist Jim Snyder. Brother Hal Smith filled in the other personnel for us, people not shown in the photograph but essential: Bob Sundstrom, banjo; Mike Walbridge, tuba; Wayne Jones, drums. An unissued on-location recording also exists, although I think I have not heard it. Were they playing THERE’LL BE SOME CHANGES MADE or perhaps RIVERSIDE BLUES? Ah, to have been there! But we have the photograph — courtesy of a Chicago wire service and then eBay. For once, I succumbed and bought it. There’s a space on my bedroom wall that needs filling with memorable hot jazz.